Charlie was born in New York. He is a retired teacher of high school English and journalism. He holds a bachelor’s degree from Rider University in Lawrenceville, N.J., and a master’s degree from William Paterson University in Wayne, N.J. He was named Morris County Teacher of the Year in 1990, and listed four times in Who’s Who Among America’s Teachers. He lives in Randolph, N.J. Charlie’s interest in ships was sparked by his grandfather, who worked in the management of a New York stevedoring company. He introduced Charlie to ocean liners through the windows of his office, which overlooked New York Harbor. His grandfather also loaned him a copy of A Night to Remember, thus beginning a lifelong interest in the Titanic. In high school and college, he studied microfilm of newspapers’ coverage of the disaster. His particular interests are the ship’s features, exploration of the wreck, the state of the wreck and the artifacts. He is also interested in Cunard, White Star and other British shipping companies. Charlie is a co-founder of TIS and a longtime trustee. He served as editor of our journal, Voyage, since the group was founded until 2006, when he became president of TIS. A lifetime highlight was making dives to the Titanic wreck in 1993 and 1996. He narrated the program “Titanic: Untold Stories,” was a member of the 1998 expedition to the wreck, and contributed to the design of artifact exhibits through 2000. He was a featured speaker on the 2012 Titanic Memorial Cruise, and has appeared in numerous television documentaries. With co-author John P. Eaton, he has written five books: Titanic: Triumph and Tragedy, Titanic: Destination Disaster; Titanic, The Exhibition; Titanic: A Journey Through Time; and Falling Star: Misadventures of White Star Line Ships. Bob, born in PA, is a retired teacher of social studies. He taught in Ridgewood, N.J. He has a bachelor’s degree from Bucknell University in Lewisburg, PA, and a master’s degree from Syracuse University. Bob, who lives in Midland Park, N.J., has two children and two grandchildren. At the age of 11, he read A Night to Remember, sparking his interest in the Titanic. His special interest is the passengers, and he has researched them for many years. He has been a TIS member since 1990 and a trustee since 1996. He became treasurer in 2003. Bob has written many articles on the passengers in Voyage, the TIS journal, and a passenger list he developed has been published and used in exhibits in Europe. Jack is a retired admitting officer for Roosevelt Hospital in New York. He lives in Cold Spring, N.Y. He is particularly interested in the Titanic’s crew and ships that played a role in the Titanic story. Another interest is the Wilhelm Gustloff. Jack is a co-founder of TIS and a longtime trustee and historian for the group. He has served as historical consultant to expeditions to the wrecksite in 1993, 1996 and 1998 and made a dive to the wreck in 1993. He contributed to the design of artifact exhibits before 2000, including for RMS Titanic, Inc., and the Maryland Science Center. He has appeared in many TV documentaries and written numerous articles for Voyage, the TIS journal. With his co-author Charles Haas, he has written five books: Titanic: Triumph and Tragedy, Titanic: Destination Disaster; Titanic, The Exhibition; Titanic: A Journey Through Time; and Falling Star: Misadventures of White Star Line Ships. Stephen was born in Quebec, and is a real estate broker with RE/MAX in Toronto, Canada. He earned a bachelor’s degree from York University in Toronto, and has two children, Laura and Patrick. He has been a member of TIS since 1994 and became a trustee in 2010, handling membership development. Stephen has a personal connection to the Titanic. His great-uncle, Weston Frazee, was traveling in Europe in 1912 with his close friend George Wright, a prominent businessman in Halifax, Canada. Wright had plans to travel on the Titanic and wanted Frazee to join him, but Frazee needed to return to Canada earlier, so booked passage on the Laurentic. Wright died in the Titanic sinking and Weston Frazee was asked to be on the committee overseeing the burial of victims in Halifax. Stephen is interested in preserving memories of the Titanic, and also has an interest in the Empress of Ireland sinking, Canada’s worst peacetime maritime disaster. He enjoys taking cruises and plans at least one vacation aboard ship every year. He has written two articles on the Empress of Ireland for the TIS journal Voyage. Craig was born in PA, where he still lives. He and his wife, Ruth, have a son, Robert. He earned a bachelor of science degree in biology from Philadelphia University and a Juris Doctor degree from Widener University School of Law. He is an attorney. His interest in Titanic began as a child when he became fascinated by an old newspaper headline he read on microfilm at the local library. Even then, he was fascinated by the microcosm of society, the bravery and the cowardice that came together in the Titanic story. His interest covers all aspects of Titanic, and has expanded to include the rescue ship Carpathia, the role of the Marconi wireless and the recovery of bodies. 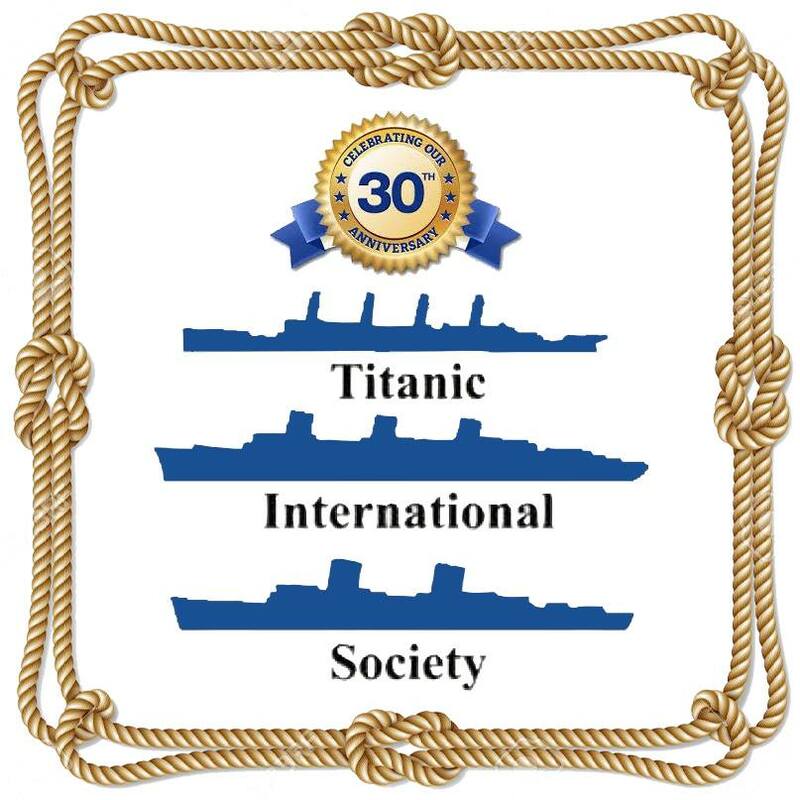 He has been a member of TIS since 1995 and of the British Titanic Society since about 1997. He became a TIS trustee in 2007. Craig collects Titanic memorabilia, and has been consulted by museums, auction houses, dealers, collectors and the media about artifact authenticity, provenance and valuations. He has written articles about artifacts and authored or contributed to sales catalog descriptions and provenance packages for major sales. Items from his collection have appeared in books, media and museums worldwide. He guest-curated the Titanic exhibition at the Independence Seaport Museum in Philadelphia in 2004-5 and is co-writing a book entitled The Ultimate Guide to Authentic Titanic Collectibles. Brandon Whited was born and raised in southwest Virginia. A lifelong history lover, his interest in the Titanic began incidentally with the purchase of a pop-up book about shipwrecks when he was ten years old. Within a year, James Cameron’s epic blockbuster had arrived. That film, combined with repeated viewings of A Night to Remember on AMC, solidified Brandon’s interest. A member of TIS since 2013, he has written a number of articles for Voyage, and is the author of the forthcoming book, Gilded with Tragedy: The Life of Titanic Survivor Eloise Hughes Smith. His particular niche interest is the ship’s passengers – especially first-class – and he enjoys visiting Titanic-related gravesites and other locations when travelling. Titanic has led to an interest in other maritime disasters, including Lusitania and Andrea Doria. Passionate about writing from the time he was a child, Brandon has also penned a number of published short stories and poems. Professionally, he has for over a decade worked in various positions within the medical field. Mike hails from Rhode Island which has many Titanic connections. He’s an early member of Titanic International Society and has served as a trustee for several years. He is co-author of Into the Danger Zone and has consulted on many Titanic and liner books. Mike also collects original ocean liner memorabilia and is a frequent contributor to Voyage. Mike resides in the Philadelphia region where he was born and raised. Having an early interest in history, he started reading about Titanic around 1983 and his interest only grew from there. In 1987 he was lucky enough to meet 6 survivors. Around that time he started collecting items related to Titanic, Olympic, and Britannic which he still actively pursues. In 2017 he wrote the book Sincerely Harry, The Letters of Henry Tingle Wilde which features 28 letters in his collection written by Titanic’s Chief Officer Wilde along with other letters written by Henry during his career. Mike currently runs the Facebook page White Star Memorabilia where collectors display their original items and has proved helpful in steering buyers away from fake items that are so prevalent today. His other interests include restoring antique cars and radios, and has been restoring a 1906 house over the last decade where he earned the local historical district Preservation Award in 2010. He works in the power industry as a controls and instrumentation technician and lives with his wife Jessica and daughter Mira. Sandy grew up in Virginia and Massachusetts. She graduated from Smith College, with degrees in both French Studies and European History. As a triple descendant of the Newell family, the Titanic tragedy has always been a part of her life. Her grandmother, Marjorie Newell Robb, the last first-class survivor, was an early TIS member and a tremendous source of information for Titanic historians and enthusiasts. Influenced by her grandmother’s Titanic experience and her love of history, Sandy wrote a short story in 7thgrade about the events of that fateful voyage, told from the point of view of her great grandfather’s Neptune ring, which was recovered from his body and is now worn by her sister and fellow TIS member, Mary Payne. Sandy joined TIS in 2012 and became a trustee in 2015. She has had a long career working in the travel and hospitality industry, in hotel sales, operations and conference/event planning. Currently, she is an independent hotel consultant for HelmsBriscoe. It was a natural fit for her to assume the role of the society’s convention coordinator. Always a New Englander at heart, Sandy now resides in northern Massachusetts with her two Scottish Dandie Dinmont Terriers, Robbe MacFarlane and Martha McArthur. Jim grew up near Sandusky, Ohio and teaches AP Environmental Science at Cleveland Heights High School near Cleveland, Ohio. Jim graduated from Allegheny College with a degree in Environmental Studies, from Ashland University for his teaching certificate, and from Miami University’s Global Field Program for his master’s degree. Jim is also part of the instructional team at Miami University’s Global Field Program and has helped instruct classes in Borneo and Belize. Jim has been interested in the RMS Titanic and the people who sailed on her since an early age when he visited the Titanic Memorial Museum in Sydney, Ohio and created a project on her sinking. He has been a member of TIS for over 10 years and wishes he had found this organization sooner! This organization has fueled his passion in learning as much as possible on the subject of the Titanic. As Membership Secretary, he works hard to keep accurate and up-to-date membership records and reply to members’ concerns within 24 hours. A former longtime trustee, second TIS President, co-founder, convention planner, and Voyage contributor, Shelley is a graduate of the College of Notre Dame of Maryland with a BA in French and modern foreign languages with graduate work in textile conservation. She lives in Connecticut and has been involved in the Titanic community since 1976 as a school and civic group lecturer, long-time moderator on Encyclopedia Titanica and web site administrator for TIS. She was an art student of survivor, Marshall Drew, and a collector of Titanic books and ship ephemera. Favorite ship? Any four-stacker but especially the legendary Mauretania.